Dukes Ride, Crowthorne: Frith no. CNE22. “Dukes Ride, Crowthorne”. Frith no. CNE22. 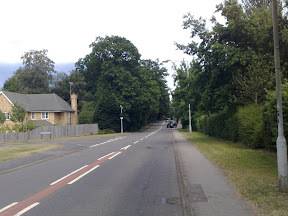 The view is rather different in 2009 – a road leading off to an estate has appeared, along with a variety of street furniture.